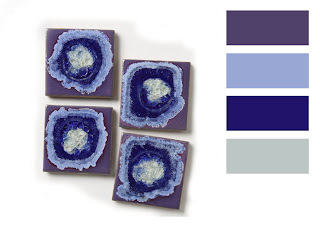 This is our last color inspiration taken from one of my favorite shops Anthropologie and for next week we are moving along to other inspirational subjects, which I have not decided yet. I will keep you posted. These are glass coasters, aren't they lovely!! The picture is from www.anthropologie.com, You can find the coasters HERE (if the link does not work, maybe the item is sold out). See you next week with a new inspirational subject.